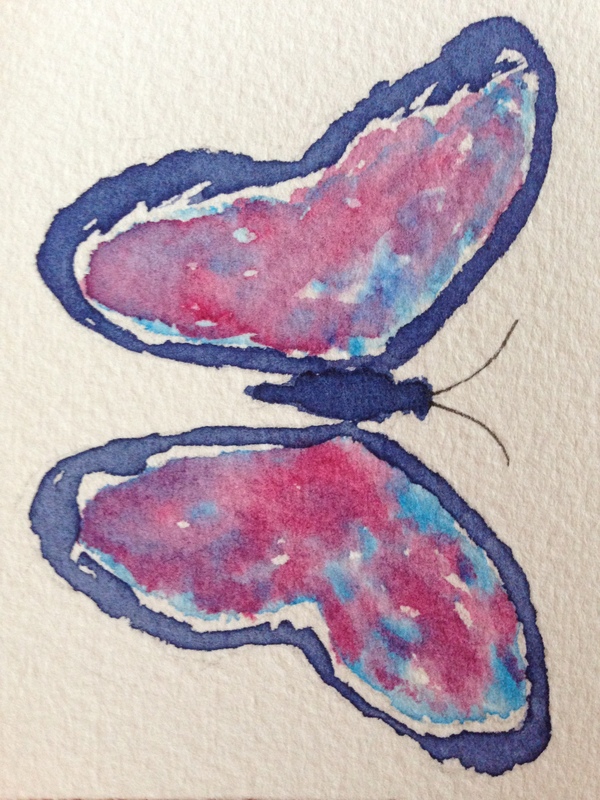 I was inspired by Jodi’s post here, in which she painted a beautiful butterfly in watercolor. What I love about her painting is that she put her own spin on it, turning out a striking result in the process. I tried something similar a couple of months back, which, for me, was to use a butterfly as a color mixing experiment. I used a Strathmore watercolor card, which is great for experiments, but might not be the best paper to use when looking for a good result. (Well, and how many green butterflies do you really see?) So I decided to try a little repeat, this time a smaller version (2″ x 3″), with Arches 140 lb. cold-press paper, blue and red (rather than yellow) and without the wax resist, instead just leaving the paper in some areas for sparkle. I’m pretty happy with the result. The thing I notice about this painting now is this: I feel like the outer wings are grabbing more attention than the inside of the wings, where the action is. Should I add another glaze on the interior wings to punch it up? Or leave as is? I’d love to get your thoughts. Hub is going to help me organize the studio/spare room/library/sleep cave tomorrow. I stink at organizing and he is a genius at it, so I’m very much looking forward to this! Happy Saturday! I like it as it is…the simplicity is very effective. I don’t see the outer line as dominant either. Organization…not one of my strong points either. Good luck! I like it as is too. Good t-shirt design or multiples in different colors for textiles. Is Hub available by the hour? Better yet, by the job? I have a few days worth of the same to get to. I sure wouldn’t mind handing it over. Pinned down isn’t good, certainly not for butterflies. Glad to hear you have artistic and organizational support. I know the value of that. Have fun! Sweet, I would love to see a whole page filled with them! That’s a great idea, C!! I may try that!! Thank you! I like the colors used inside the wings. I wonder if there is a way to make it seem more three dimensional? That’s a good point, Kirk. Yeah, it could definitely use some dimension. Usually I get that with shading, but I wasn’t really thinking about shading here. Great feedback, thanks. Lovely Laura – I have no knowledge of watercolor so I wouldn’t be any help there. Because the outer edge is darkest it pulls forward, to get the inside of the wings more prominent consider lightening the outer winged area and darkening the inside section, or make the outer edging thinner so it doesn’t draw too much attention from what you want to be the focal point. In any event, I like your painting just fine as is. Thanks, Mary, those are excellent notes, and I will consider those for my next one. Great tips! The negative space between the outer most line and the color inside creates a cool transition, adding interest between positive and negative space. It would be interesting to see what it would look like if that negative space snaked it’s way further inside the wing, creating a bunch of little islands of those groovy red and blue hues.